The East Village Playhouse, the new home of The City Kids Foundation, is an intimate space where you can catch the amazing one-man show A Brooklyn Boy. 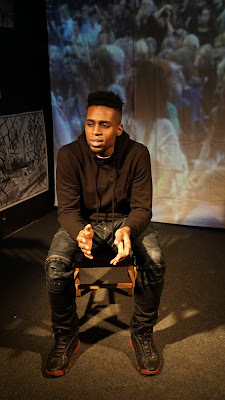 Moises Roberto Belizario, former Artistic Director of City Kids, directs Steven Prescod in a story which includes dozens of voices and much vibrant dancing. Book, Music and Lyrics are by Belisario and Prescod, with inspiration drawn from Prescod's childhood in Brooklyn. The show includes vocal recordings by Alyson Brown, Clinton "Isaiah" Graves III, Ben Joseph, and Cenophia Mitchell, and additional music by Anjelica Dorman, Terrance James, Ernest Lewis, and Ben Vernon. At a political rally, Steven asks why people are sitting down instead of protesting in the streets. To answer this question, we go back in time to Bed-Stuy, Brooklyn in 1990. A memorable party is happening, and Kathy, the fifteen year-old host, is romanced by the smooth-talking Jamaican, GT (the man with the gold chain). We see Steven, as both Cathy and GT, dance with himself. These characters are his parents, and Steven is born soon after. His father promises he will get ten jobs and stand by his mother (who wonders if he can get one job). It looks like a beautiful life has begun, but, as Steven tells the story, his father had a temper and soon was incarcerated. Steven meets his father years later, on a visit to jail, after growing up with his wonderful mother and vivacious Caribbean relatives. Hip-hop storytelling brings Steven's childhood to life. For his fifth birthday, Steven gets a party at Chuck E. Cheese's. However, the big rat is scary, just like the ones on the street. For his sixth birthday, he gets a bike, which is a great joy to ride with training wheels. His mother takes the training wheels off, and although Steven isn't ready, he takes a risk in order to learn. This touching scene is backed by the song "Mama Don't Let Me Go". As Steven grows older, he can bike around with new friends, some of whom are getting into trouble. Steven doesn't want to "jux" unsuspecting people on the street, but if he doesn't, he fears the neighborhood will think he's a punk. The story goes back and forth between some dangerous incidents (a gang fight in a bodega, his friend Kwame getting shot and ending up in a coma) and Steven's court date. He is given a choice between 5 years probation and 7 years upstate. The catch is, he has to explain to his mother, in court, what he did. We see more reasons why Steven is thankful to be alive. As he grows older, he sees grown men fighting his young friends, and a drunk white guy who menaces him (an opportunity to think about Jim Crow). Ultimately, his friends are happy to see him interning with an arts workshop (City Kids), which they refer to as that "Sammy Davis Jr. program" No one should have to live in a world where cops expect to be thanked for not shooting you. As the performance ends, Steven tells how he anonymously turned in to the police a gun which his friend left with him. Guided by religious role models (accompanied by the song "Receive My Praise"), Steven seeks to take himself out of the cycle of violence. The energy in The East Village Playhouse is powerful indeed. I didn't mind the tight seating arrangements, not when amazing dancing was happening right in front of my eyes. Moises Roberto Belizario told the audience the story of this piece. Not only did the Duke and Duchess of Cambridge enjoy an excerpt they saw a few years ago, the show has grown and will tour to Los Angeles and beyond. In accordance with the mission of City Kids, I will post that young people are encouraged to see this show. I have a few young New Yorkers I am telling about this fine production. Steven Prescod's ability to sing, dance and play upwards of 30 roles for an hour is a joy to behold.